On 19 October 1330, at dusk, two dozen men gathered in the centre of Nottingham. They were mostly in their twenties, and all on horseback, ready to ride out of the town. But unlike merchants or pilgrims assembling to set out together, these men were silent and unsmiling. Beneath their riding cloaks they were all heavily armed. The reason for their gathering lay within the fortress which overlooked the town. Somewhere within those walls, high on the massive outcrop, was Roger Mortimer, the earl of March, who kept the young king, Edward III, within his power and ruled in his place. Several of the riders had already been summoned that day to see the brooding dictator. He had questioned each of them in turn; all but one had refused to speak. The only man who had dared to answer back was their leader, Sir William Montagu. He had replied evasively that he would give a short answer to anyone who accused him of being part of a plot inconsistent with his duty. Mortimer had let him go, but not with good humour. Now Montagu was waiting. He knew it would only be a short time before Mortimer would arrest him and his friends. Mortimer had already given the order that the guards were to ignore the king's commands, and only to obey his own. How suddenly political fortunes changed! It was only four years since Edward II had been swept from power by Mortimer and Queen Isabella, his mistress. It was only seven months since the earl of Kent, the king's uncle, had been beheaded on Mortimer's orders. Shortly after that, the young heir to the earldom of Arundel, Richard Fitzalan, had been arrested before he could carry out his plan to seize Mortimer. Montagu had no wish to suffer the same fate. Nor did he wish to see the young king set aside. He had spent most of the last twelve years at court, and had seen Edward III grow up. But that was how serious matters had become. The future of the English monarchy was at stake. Somewhere in that castle above, young Edward was in fear of his life. Montagu believed Mortimer was plotting his murder and the seizure of the throne. 'It is better to eat the dog than be eaten by the dog,' Montagu had remarked quietly to the king, after being dismissed from Mortimer's presence. But as Montagu knew, it was one thing to suggest 'eating the dog' and quite another to do it. Mortimer had spies everywhere. Although John Wyard had been the king's trusted friend for several years, it emerged that he was an informer. It had been Wyard who had told Mortimer of Montagu's plot. Mortimer had been thrown into a fury, like 'a devil for wrath'. And now he was on the defensive, perhaps about to order all their deaths. Already he had mustered troops throughout the kingdom, ready to defend his position. He was, after all, a soldier, one of the very few successful war commanders of the last twenty years. He was a clever manipulator and an arch-propagandist. Men like him, when they know their lives are stake, cannot be trusted. Montagu and his men rode through the town and then south, as if they were in flight. But they were not running away. They were about to embark on a dangerous and adventurous mission. Their courage was swelled through their companionship; they were friends as well as fellow plotters. With them rode William Eland, the castellan or overseer of the castle. It was his idea that had prompted them to ride out into the gloom. Some way out of the town Montagu gave the signal for them to stop. By now Mortimer would have heard that they had fled, but he would not pursue them until the morning, for there would be no moonlight tonight. They waited until the darkness was nearly complete, and then they turned back and led their horses slowly across to the hunting park by the river. At a thicket which Montagu had chosen as their mustering point, they stopped and waited for those conspirators who had not been interrogated earlier, who had remained in the town, waiting for night to fall. It grew cold. No one came. Before long they realised that they were on their own. Maybe their companions had been arrested. Or maybe their courage had failed them. It was Montagu's decision to go on. There were only about twenty men with him, and Mortimer had more than two hundred in the castle. Their plan was a desperate one, to attack through a secret passage which William Eland knew. It led, he said, directly into the building in which the queen was lodged. The king or someone acting on his behalf would unlock the door at the top. Then Montagu and his men had to overpower the guards, arrest Mortimer, and silence those present before anyone could raise the alarm. Most of all they had to stop Mortimer getting a message out of the castle. If he did that, they were all done for. But the men gathered with Montagu were neither cowards nor weak. They were the very pick of the young English nobility, prepared to die rather than be shamed in honour or arms. Robert Ufford was there, William Clinton, the brothers Humphrey and William Bohun, Ralph Stafford, and John Neville of Hornby. There too were Thomas West, John Molyns, William Latimer, Robert Walkefare, Maurice Berkeley and Thomas Bradeston. If they succeeded, all their names would be celebrated for centuries. If they failed, they would probably be hanged as traitors the next day, their lands confiscated, their wives and children locked up. Montagu decided that they could wait no longer, and they would have to go on alone. They tethered their horses at the thicket, and followed Eland carefully along the marshy riverbank. After a while they felt the great rock on which the castle was built. A little further on they came to an opening. They entered the tunnel and began to ascend its long, steep slope. High above them, within the queen's chamber, Mortimer, Queen Isabella and the bishop of Lincoln were discussing what to do about the intended coup. Mortimer had let the men go in order to organise the case against them carefully. They should be indicted for treason: that was his way of crushing opposition. Parliament would assemble in the hall of the castle on the following day. Those who had fled could be charged in their absence, soldiers pursuing them at the same time. There would be ample opportunity to seize them over the next few days, one by one if necessary. If they fled the country, well, so much the better. Pancio de Controne, the king's Italian physician, visited Edward in his room elsewhere in the castle. The king had retired earlier, probably claiming ill-health, to get away from Mortimer. Robert Wyville, Isabella's clerk, was also up and about. Probably either he or de Controne went down to the basement of the queen's lodgings, and checked the bolts on the door to the spiral staircase which led down to the secret passage. This secret door, which few of the important people would have known about, was the keyhole through which the castle could be unlocked. In the silence of the night, while Mortimer and Isabella talked with Bishop Burghersh in Isabella's chamber, the bolts were slid back, leaving the castle open to attack. About midnight, in the darkness, the door swung open, pushed by the hand of William Eland. If a torchlight was burning there, it would have revealed the determined faces of those following him: John Neville, William Montagu, and the others. One by one they came up the last few steps. They proceeded to climb the stairs, as quietly as possible, up into the tower of the queen's chamber. At that moment a door opened. Sir Hugh Turpington came out, looked along the corridor, and saw them, their weapons ready. He had no sword with him, but he drew his own dagger, and, without thought for his own safety, yelled the warning 'Traitors! Down with the traitors!' Turpington hurled himself at Sir John Neville. Neville lifted his mace and, side-stepping, smashed it into the head of the royal steward, who fell in a pool of blood. But his final cry had alerted the others. Next came the chamber guards. Mortimer realised what was happening and grabbed his sword. Two more men were killed defending him. Men rushed at Mortimer; they seized him, and his sword clattered on the floor. Isabella, realising that the attackers could not have got into her apartments without her son's help, screamed into the dark corridor 'Fair son! Have mercy on the gentle Mortimer'. A few minutes later it was all over. The king went with Montagu from chamber to chamber, ordering the arrests of Mortimer's sons, Geoffrey and Edmund, and Mortimer's henchman, Simon Bereford. The bishop of Lincoln - Mortimer's closest friend - was found trying to escape down a privy chute. He was told he would not be arrested. Mortimer, however, could expect little mercy. He was bound and gagged, and led down to the basement and then pushed through the door into the tunnel. Then he was taken down, out into the park, tied to a horse, and removed from Nottingham and power. It might seem strange to begin an account of the life of Edward III with an event in which he personally played little part, but it is appropriate. For the first four years of his reign Edward had struggled to do anything in his own interest. He had been utterly disempowered by his mother and Mortimer. It is a telling fact that it was his closest and bravest friends who allowed him properly to take the throne. Reliance on his most courageous and capable advisers, who understood bonds of chivalric companionship and the cult of noble achievement, would be a hallmark of his whole reign. When Edward had been crowned, his reign had been greeted as that of a new Arthur, and his young, brave, energetic knights all wished for a place at the round table. They knew that in order to gain such distinction, they would have to earn it. And Edward knew that in order to lead these men, he himself would have to show extraordinary courage. No other medieval English monarch had come so close to being put out of his royal inheritance. Edward was determined to demonstrate that he deserved his crown. It was this determination which inspired his friends to help him. Within a few years of the Nottingham Castle plot, Edward won his first great battle. By the age of fifty he was famous as the master of European military strategy. Glorious battle had followed glorious battle, orders of chivalry had followed chivalric achievements, so that to be a member of his Order of the Garter was an exceptional honour. He had given England pride, prestige and, through the championing of St George on an unprecedented scale, a new national identity. The nation's wealth had massively increased. The blight of the plague had been weathered. He had taken greater pains than any previous monarch to work with parliament in framing legislation for the benefit of the kingdom. For the next three hundred years he was hailed as simply the greatest king that England had ever had. Just how great Edward's reputation was, and how long it lasted, can be seen by referring to assessments of his character written between the fourteenth and the seventeenth centuries. A contemporary wrote in a long eulogy that he was 'full gracious among all the worthy men of the world, for he passed and shone by virtue and grace given to him from God, above all his predecessors that were noble men and worthy'. His only failing, according to this writer, was his lechery - 'his moving of his flesh haunted him in his age' - and this was the reason why the author thought his life had been 'cut short'. This was intended as a joke. At sixty-four, Edward had outlived almost everyone of his generation. Fortunate beyond measure... wise and provident in counsel, well-learned in law, history, humanity and divinity. He understood Latin, French, Spanish, Italian, and High and Low-Dutch, besides his native language. He was of quick apprehension, judicious and skillful in nature, elegant in speech, sweet, familiar and affable in behaviour; stern to the obstinate, but calm and meek to the humble. Magnanimous and courageous above all the princes of his days; apt for war but a lover of peace; never puffed up with prosperity nor dismayed at adversity. He was of an exalted, glorious, and truly royal spirit, which never entertained any thing vulgar or trivial, as may appear by the most excellent laws which he made; by those two famous jubilees he kept, and by the most honourable Order of the Garter, which he first devised and founded. His recreations were hawking, hunting and fishing, but chiefly he loved the martial exercise of jousts and tournaments. In his buildings he was curious, splendid and magnificent, in bestowing of graces and donations, free and frequent; and to the ingenious and deserving always kind and liberal; devout to God, bountiful to the clergy, gracious to his people, merciful to the poor, true to his word, loving to his friends, terrible to his enemies... In short he had the most virtues and the fewest vices of any prince that ever I read of. He was valiant, just, merciful, temperate, and wise; the best lawgiver, the best friend, the best father, and the best husband in his days. Maybe some other ruler somewhere has, at some point in history, received praise as great and all-encompassing. But if so, he was not a king of England. Then something happened, something which none of Edward III's contemporaries could have predicted. Social change allowed a new front of politicised historians to step forward. These men were less interested in the champions of the past and keen to understand how society had developed. Indeed, within a short while they were only too ready to kick the heroes of yesteryear. Froissart's chronicle - a benchmark of chivalric history - became regarded as a literary masterpiece but worthless as historical writing. Chivalry became the stuff of fiction. Sir Walter Scott led the vanguard of interest in the deeds of knights: a poet and novelist, not a historian. The great historians of the period were exploring how ideas and social movements, coupled with the leadership of political figures, had changed Europe. By comparison, the age of chivalry seemed stagnant, unchanging and distasteful in its glorification of violence and bloodshed. The development of historical writing along social themes in the early nineteenth century dealt a succession of severe blows to Edward's reputation. History itself became less a matter of narrative than judgement, and this was not just judgement on individuals but power structures and social hierarchies. There is no better example of the High Victorian ethos of historical condemnation which annihilated Edward's glory than Lord Acton's famous phrase: 'power tends to corrupt and absolute power corrupts absolutely. Great men are almost always bad men'. William Stubbs, peering down on the middle ages from the twin heights of an episcopal throne and a professorial chair, condemned Edward as 'ambitious, unscrupulous, selfish, extravagant and ostentatious'. Such attitudes were strongly supported by the popularity of massive, all-encompassing histories which compared individual kings's achievements with the demands of modern society. As a political leader, Edward III was judged to have prejudiced his kingdom's economic and social welfare for a series of expensive and ultimately futile foreign wars, calculated only to add to his own personal grandeur. As a cultural patron he was deemed insignificant because subsequent generations had destroyed most of his great buildings, and as a social reformer he was castigated for attempting to undermine the social changes of the mid-fourteenth century, thereby creating the social tension which led to the Peasants' Revolt. And his love of women generally, and Alice Perrers in particular, was seen as morally reprehensible. In every area in which a great king should be forward-thinking, he was portrayed as conservative or regressive, and in every area in which a king should be circumspect, he was judged reckless. It was the venturesomeness of war, its stirring strife and magnificent pomp that delighted him - as it has delighted barbarians in all times... Courage he possessed in an eminent degree, combined, however, with no small amount of chivalrous rashness... Of his personal character in other respects but few traces remain, and some of them are not such as to excite much admiration. Conjugal fidelity at that time was not considered a necessary virtue in sovereigns, and certainly was not practised by Edward III. In this matter it is but fair to judge him by the habits of the times, but his disgraceful subjection in his old age to a worthless woman was the natural sequel to a licentious life, and deeply stains the conclusion of his reign. That he was unscrupulously despotic is clear enough from the facts mentioned in the course of this history, and that he was cruel and revengeful is far from doubtful when his conduct to the burgesses of Calais is considered; for he either intended to put them to death in revenge for their courageous defence, or else, with cat-like wantonness, cruely disregarding their misery, tortured them with the fear of a punishment he never intended to inflict. dazzled by the splendour of the victories they [Edward III and his eldest son] gained into a blind forgetfulness of their vanity, or into an unreflecting admiration of two men, who, though possessed of qualities particularly qualified to excite the admiration of unthinking hero-worshippers, have but little claim to commendation of the wise and thoughtful. That was how he ended a two-volume study of Edward III: an exhortation to disregard the man's achievements and to meditate on the barbarity of his behaviour, completely failing to consider him as a man in his haste to condemn the values of the age. Longman's portrait was deemed 'remarkable for its justice, its variety of interest, and its completeness as a picture of the times' by Edward's next biographer. The Reverend William Warburton was, in fact, a little more sympathetic to Edward than Longman, and more subtle, pointing out that Edward 'understood better perhaps than any other sovereign of his dynasty the great importance of keeping on good terms with his people', adding that 'almost in every successive parliament he had the credit of making concessions to the nation...' However, Warburton's compliments always have a fatal sting in the tail, in this case adding: 'but he was, in all probability, quite as arbitrary as the most arbitrary of his predecessors'. Unlike Longman he does not damn Edward outright for his warrior-gallantry, but belittles him, stating that 'as a soldier and a legislator he looms large between Edward II and Richard II, but seems a man of ordinary stature when measured with the great first Edward or the greater first William'. On and on he goes, diminishing Edward at every opportunity, mainly for his failure to have lived in other centuries. But then Warburton was a man who saw the Black Death as one of the 'real glories' of the fourteenth century, for by it the English serf was freed from servitude. In so doing he shows how little he understands the social priorities of the fourteenth century. He also demonstrates a gross detachment from everyday human existence: the agonising and lonely deaths of one in three of the population of Europe was the antithesis of glory in the fourteenth century, just as it would have been in the nineteenth. For Warburton, another 'real glory' was the loss of Gascony, allowing England to 'acquire its insular character'. Probably only Englishmen between the French Revolution and the Great War could have seen the acquisition of an insular character as a positive development. Basically, in Warburton's eyes, Edward was a bland third-rater because he had not contributed to nineteenth century industrial democracy, as far as Warburton could see. Rarely has a biographer been so unfair in his expectations of his subject. The third and last of the Victorian biographers was the best writer of the three and the worst historian. Dr James MacKinnon was a biographer of such extreme prejudice and perverse judgement that one quakes under his sentences. Yet, steadying ourselves after reading his outrageous and wrong judgements, we have to reflect that he too was a product of his time. Writing in 1900, in a society whose fear of war was of paramount concern to men such as himself, the fact that Edward was a warmonger was enough to seal his fate. Throughout [Edward's French war] we are repelled not only by its heartless brutality, but by the sordid motives that actuate it. Would-be conquerors of the stamp of an Edward are impervious to considerations of humanity or morality. Let Edward conquer, even if the world perish! But apart from moral and human considerations, it really is marvellous that it did not occur to the aggressor that devastation was a questionable path to a people's love and submission. Without prejudice, I think I may conclude, from a calm view of ends and results, that in this matter of external statesmanship, Edward is without balance, without true insight, without morality, without real grandeur, and his reign is that of a man who exhausted his country in the pursuit of selfish, and therefore essentially unpatriotic objects. Dr MacKinnon was not entirely negative about Edward. In fact, unlike Warburton, he allowed a few complimentary comments to stand without qualifying them with gratuitous faint-praise. He acknowledged that Edward did not seek to play the despot over the nation, and was 'not devoid of the good qualities of an administrator'. He admitted that he did not rule without reference to the law, that he encouraged free trade (a great virtue in the Great Britain of 1900), that he employed Chaucer and that he was devoted to building 'in keeping with the trend of the age'. But then he socks Edward a huge blow. We could wish that there were no reverse side to this picture, yet we greatly fear that the reverse side is the picture. It would be going too far to say, as some have done, that that he regarded his country solely as a tool of his ambitious schemes of conquest, but he certainly did so in far too large a degree. There must have been something radically wrong in the regal conceptions of a monarch who loaded himself with debt and extorted from an unwilling people... enormous sums for the maintenance of a war undertaken mainly from motives of ambition... Edward made war not only on his enemies but on his people. Even more extremely, just before going on to blame Edward personally for failing to produce an English poet equivalent in greatness (in Dr MacKinnon's opinion) to Petrarch, he gives the knife he has plunged again and again into Edward's reputation a final twist. The strong personality of a virtuous king can make its own moral atmosphere, and exert an incredible influence for good, even if the materials he has to work with are none of the best. The master mind, the noble soul is after all the measure of his age, on the throne at least. For this mastery, this nobility, betokening the truly great man, we look in vain in Edward III. So why is this book called The Perfect King? Surely, if there is such doubt about his achievements, and if we cannot judge past leaders by our own standards, 'perfection' is an inappropriate term for anyone, especially a king. All kings have failings, and Edward III had as many as most men. But I am inspired by the idea that a monarch's vision of kingship is an important factor - perhaps the most important factor - in understanding his life and reign. Kingship is a creative act. To be a good king requires vision, in the same way to be a good architect or a good military commander requires vision. Obviously vision alone is not enough: a medieval king was required to realise his ambitions under pressure, mindful that thousands of lives depended upon his decisons, including his own. But we may observe that the least secure medieval kings were those whose concept of kingship did not match their subjects' expectations. 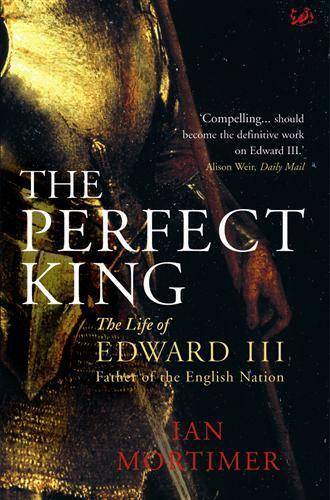 'The perfect king' is not what Edward III was: it is what he tried to be. If all statesmen are less than perfect, the best we can hope for is that they have some vision, some principles, and some idealism, at the outset of their careers at least. The idea that a leader's vision of his role may be the key to understanding his character underpinned the volume which was the precursor to this study: The Greatest Traitor: the life of Sir Roger Mortimer. In that work the centuries of opprobrium and denigration which had encrusted the historical reputation of Mortimer were stripped away to see how he himself would have construed his relationship with the king. He was portrayed alongside other characters who had royal associations to show his role models, his rivalries at court, and the opportunities open to him. In this way his ambitions and vision were contextualised, and his character - or at least his career - could be understood in its varying stages, not as a static finished product but as a human development. It is harder to do this with a king. Earls can be compared with earls, barons with barons, but the social pyramid permits no comparisons for a monarch. Hence we find kings being compared with each other. This is justifiable in some respects: Edward III was inspired by his grandfather (Edward I) and deeply conscious of his father's failings. But it would be wrong to compare him as a monarch with, say, William I, or even his grandfather, for the challenges he faced were of an altogether different nature. This is why it is intellectually incongruous to find kings compared in the pages of history books, and judged as less or more successful in relation to each other, like so many schoolboys in the curriculum of national progress. Yes, we may play the teacher and call out the names of Edward I, Henry V, Richard I and William I to award them each a gold star for being outstanding war leaders. But in so doing we must consider the opportunities open to them. Why not call out Henry II in the same group? Because he fought no war sufficiently important for that to become the chief characteristic of his reign. This was not because he lacked the qualities of a war leader. His reputation was so great that he did not need to demonstrate his leadership skills on the field of battle. In describing the life of a medieval king, we need to get behind the traditional images of war leaders and legislative reformers to see the individual in relation to his own ambitions and the expectations of his contemporaries, carefully distinguishing between the achievements of the ruler and the reign. The above problems of royal historical biography - extricating the character of the man from the obscuring effects of historical judgement, distinguishing between the character of the king and the characteristics of his reign, and assessing the king's achievements in terms of his own vision and challenges - are general, and apply to most political leaders. The biographer of Edward III must deal additionally with problems which are peculiar to his reign. The most obvious is the extraordinary romanticism of the sources and the chivalric fervour of the period. To read about the events of Edward's reign is to experience the opposite of the 'willing suspension of disbelief'; one constantly has to question whether events could really have happened as recorded by contemporaries. The opposite effect is at work: the constant nagging of disbelief. Edward III's experiences are so extraordinary that the period 1326-1350 reads at times like a fairytale with footnotes. This raises some serious issues. How can we account for the unattainable ambitions of men who dreamed of chivalrously fighting to the death: an �lite whose very raison d'�tre was to don armour and charge into battle, hoping for a glory which was not only personal but spiritual? Will we ever be able to understand them? The age is too much the stuff of Boys' Own stories: the valiant warrior, the noble king, the lady and her lover. The modern world simply does not believe in heroics and passions on this scale. Scholarship especially runs scared of fervent quests for glory. If we acknowledge the existence of such feelings, we tend to diminsh them: the fearless knight becomes illiterate and ignorant, the passionate lady becomes a woman frustrated by a male-dominated society. We cynically explain the motives of the man who goes on campaign, or fights to the death for his lord. Perhaps only the anonymous men at the bottom of the social spectrum - the landless labourers, who lifted their spades in the years following the Black Death and started to conform to the modern stereotype of the downtrodden peasant, resentful of his servitude - gain widespread and genuine modern sympathy. There is another side to this romanticism/cynicism coin. At some points in Edward's life the evidence does not read as fable, but should. Edward III and his contemporaries were some of the greatest propagandists who ever lived, and inclined not only to spin a skirmish as a chivalric victory but also to downplay an embarrassment, or to destroy evidence relating to secret or compromising events. This is best represented in the fake death of Edward II in Berkeley Castle in 1327. Edward purposefully suppressed discussion of his father's survival. He personally destroyed evidence (his chamberlain's accounts) relating to the period when we might reasonably have expected him to have been arranging the return of his father's corpse to England. This creates the most extraordinary problems for the biographer, who cannot simply ignore Edward III's relationship with his father's keepers, or the circumstances of his survival, after 1327. With so little definite evidence extant, and so much evidence relating only to nondescript 'secret business', it is hardly surprising that many historians prefer to avoid the debate, and hide behind a cloak of ill-defined scepticism. It does appear - superficially at least - to be the safest intellectual position. But in historical biography, to err on the side of caution is still to err. An understanding of a subject's character will not be illuminated by his biographer's own timidity or ignorance. The bottom line is that the difficulty of treating a hidden or secret aspect of a man's life is not a good reason for his biographer to ignore it, quite the reverse. The questions arising from Edward II's false death in Berkeley Castle are complicated, as one would expect, and a biography of Edward III is not the place to go into the matter in great depth. But the implications for Edward III of his father's secret survival were far more important than any other writer to date has been prepared to admit. Suffice to say that, as a preliminary to this study, these questions have been revisited, discussed with leading scholars of the period, argued out, checked and revised. The result is the most thorough analysis of the information structures underpinning the narative of the demise of a medieval English king. In particular, the fake death in Berkeley Castle and its repercussions are discussed at length in an article in The English Historical Review (the foremost peer-reviewed historical journal). This concludes that we may be 'almost certain' that Edward II was still alive in March 1330. An analysis of the post-1330 evidence for Edward II's custody in Northern Italy is also being prepared for scholarly publication. Abstracts of these papers appear in Appendices Two and Three of this book respectively. The last problem facing a biographer of Edward III which needs to be mentioned is perhaps the most obvious. The sheer scope of the man's life is awesome and hugely challenging. Writing this book has, at times, felt like experiencing the most beautiful, escapeless nightmare: the subject is so vivid, fascinating and inspiring; but the man ruled for fifty years! It would take considerably more than fifty years to become fully acquainted with all the documentary and physical evidence remaining from the reign, and to sift it for what is pertinent to Edward himself. True, five other British monarchs have reigned even longer (Henry III, James VI of Scotland, George III, Victoria and Elizabeth II), but their lives would not be easy to encapsulate either. Furthermore, the sheer dynamism of Edward III gives his reign several dimensions not present in any of these others. Edward III was not just head of state, he was his own prime minister, his own foreign minister and his own Field Marshal. He was his own law-maker and justice. He was a patron, a consumer, an innovator and an arbiter of taste. He was also a husband, a father and a friend to many. To write a biography of a man who actively associated himself with so many roles is like trying to write a study of a dozen politicians, military chiefs, economists, law-lords and multi-billionaire art collectors and philanthropists rolled into one. Perhaps because of these problems, and perhaps because of the derision of his achievements in the nineteenth century, few modern biographers have been tempted to write about Edward III. Just three books purporting to describe his life were published in the last century, and none of these is a detailed study. This might suggest that there is a shortage of writing, especially good writing, on Edward III. But if we look for books on aspects of his kingship we find an abundance in the form of studies of the Hundred Years War, chivalry, his sons (especially the Black Prince and John of Gaunt), his eminent ecclesiastical contemporaries, coinage, literary characters (especially Froissart, Chaucer and Langland), the development of parliament, the development of the English language, the Black Death, local government, the wool trade, social regulation, and the laws of treason. There is a willingness to write about his reign which is strangely contrasted by a reluctance to write about his character. Some scholarly articles, particularly Mark Ormrod's consideration of Edward's personal religion, are biographical, and repay repeated reading in an attempt to understand the man. But the vast bulk is like the flotsam which scatters the sea after the sinking of a great ship: it is obvious that something huge and magnificent was here, and has disappeared from view, but one struggles to see exactly what. This book is by no means the first work to restore Edward III to a more appropriate place in the pantheon of English kings. That distinction probably should go to two very different pieces of mid-twentieth century scholarship. Edouard Perroy, a Professor of Medieval History at the Sorbonne, wrote his extraordinary book The Hundred Years War in 1943-44, while fighting for the French Resistance, or, as he put it, playing 'an exciting game of hide and seek with the Gestapo'. He had no access to his research materials at the time but, in his words, 'suddenly flung into outlawry, abruptly parted from my familiar environment of students and books, I seemed, in contact with this present so harshly real, to gain a better understanding of the past'. And he added that as a result of his circumstances, certain actions had 'become more comprehensible; one is better placed to explain a surrender, or to excuse a revolt'. His Edward was a successful diplomat as well as a military leader, able to outmanouevre Philip of France at almost every opportunity: 'a political genius fertile in fresh ideas, but at the same time a cold calculator who drew up long-term plans, knew where he was going and what he wanted, and surpassed his adversary in the diplomatic sphere just as he crushed him on the field of battle'. Perroy also destroyed the idea that the cause of the Hundred Years War was Edward's dynastic ambitions: 'nothing is further from the truth', was his view on the subject. Everyone seriously interested in the fourteenth century has been in his debt ever since. The other pioneering rehabilitation was May McKisack's landmark lecture, 'Edward III and the historians', delivered in May 1959. In a straightforward and brilliant piece of historical observation, in which practically every sentence is a revelation or a delight (and many are both), she at once showed how Edward III had been the victim - not the subject - of historians since the early nineteenth century. 'Historians whose whole thinking has been conditioned by notions of development, evolution and progress, sometimes find it hard to recognize fully or to remember consistently that these meant nothing to medieval man...' Or 'Edward III in the days of his glory is hidden from us by the cloud of contemporary adulation...' Wonderful. Perhaps this short lecture should be handed out to all history students in the hope that thereby a little wisdom can be shown to be a powerful tool in assessing a man's achievements. Its fifteen pages end with a final sentence which is the launchpad for most modern writing on the king's character: 'For all his failings, it remains hard to deny an element of greatness in him, a courage and a magnanimity which go far to sustain the verdict of one of the older writers that he was a prince who knew his work and did it'. Since 1959 various writers have gradually pushed towards a closer and more realistic understanding of Edward III. In 1965 he was the subject of Ranald Nicholson's excellent Edward III and the Scots, in which his importance in turning England from a feudal kingdom into a nation was underlined. The 1970s saw little Edward III-related activity, although four biographies of his eldest son (the Black Prince) appeared in just three years. Probably the major contribution at this time was Michael Prestwich's spirited evocation of the period in his The Three Edwards: War and State in England 1272-1377, published in 1980. By this date Edward's leadership skills had set him back on the list of England's successful kings, and Prestwich's book brought home Edward's courage and patronage of chivalry, and the adulation of his contemporaries. The 1980s saw the renaissance of serious attention on Edward III, particularly with a series of original and impressive biographical articles by Mark Ormrod. This attention continued in the 1990s and 2000s in works such as Ormrod's own The Reign of Edward III, Juliet Vale's Edward III and Chivalry, Clifford Rogers' original and revealing book on Edward's military strategy, War Cruel and Sharp, and a volume of essays edited by James Bothwell, The Age of Edward III. By 1992, after more than a century of prejudice, it was possible for a scholar once again to hold the view that 'The fifty years from 1327 until 1377, which encompass the reign of King Edward III, can be reckoned one of the longest and most successful periods of late medieval English kingship'. Lastly, although it is not a direct study of Edward III, it would be churlish not to mention the first two volumes of Jonathan Sumption's multi-volume work on the Hundred Years War, which, in the very high quality of writing, narrative accessibility, scope and detail (from both the English and the French perspectives), reveal Edward as a harrassed, impetuous, frustrated and egotistical man - but a capable, committed and sometimes brilliant war leader - on the bloody stage of fourteenth century Europe. It certainly provides the best available account of the great conflict which can only briefly be covered in a single-volume biography of one of its many leaders. Edward's reputation has thus been exalted to the heavens, forced through the mangle of Victorian cultural conceit, and gradually restored to its proper place of exemplary leadership, at least in the pages of military history and chivalry. But from this point on we can lay aside Edward's historical reputation and search for the man himself. What was he really like? Was he really a leader without equal? Was he a cruel, selfish, warmonger? Or was he a loving husband, conscientious ruler and champion of England in the eyes of his people? What should concern us primarily from here on is not how Edward's successors thought of him, nor what the future will think of him, nor even what the most up-to-date academic judgement makes of his successes and failures in relation to his society, but who he was, what he wanted to be, how his contemporaries saw him, and what he thought of himself. To determine these things might be the hardest historical task there is. It is like trying to describe an ancient bonfire on the strength of its wind-blown ashes. But the fact that this man existed, in truth, and lived a life which is so unlike our own, and yet experienced triumph, glory, disaster, suffering, fear, grief and love in ways which we would all recognise, is a good enough reason to make the attempt.